It has continued to bloom and now, the second (pink) cactus has set buds too. I don’t think it will bloom before the holidays, but maybe by New Year’s. It’s hard to tell. The buds are fat but don’t look ready to pop. 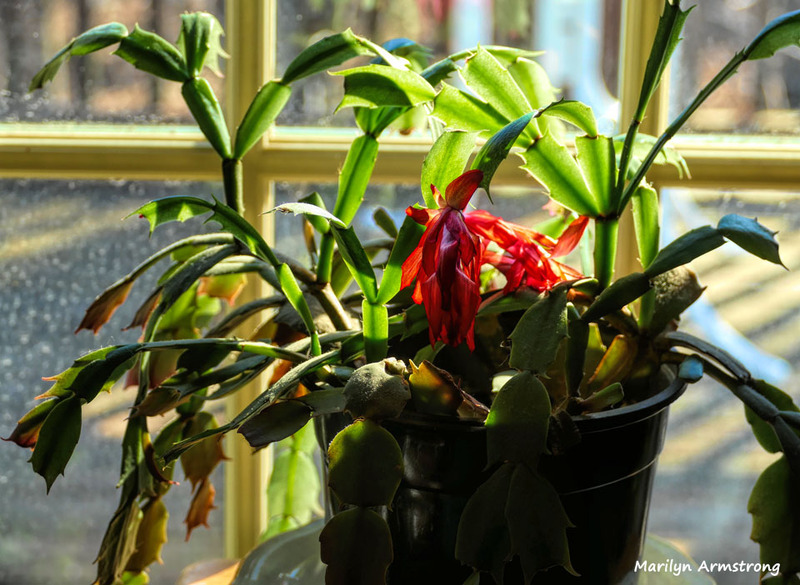 Meanwhile, Merry Christmas from our Christmas cactus to yours — or you — depending! They are indestructible. My broken piece of cactus has now made roots and I have replanted it. I’ve had pieces of these land on the floor of the car and come back and found they’d grown roots. Once you get them going, they are incredibly hardy. And pretty. Oh, and it’s snowing. A little bit. Thank you very much Marilyn (or the Cactus – depending. 😉 ) on behalf of Me and Mum. Bob – thanks for a wonderul year of sharing laughter and woe. Wishing you and your Mum a very Merry Christmas, brimming with happiness, good health and sanity — from our house to yours. The furry kids also send their best. Time to lift our glasses and sing a rousing round of “Waltzing Maltilda”. (Won’t be buying one of the full series of Grange Hermitage from our Penfold’s Winery (the ’51-’17). Sold one set last week for A$330,000. A bottle of the original ’51 sold for $50,000. Dral, Merry Christmas — I hope Santa knows you’ve been a good lad. The Christmas Cactus really is a Christmas gift. It’s better than ornaments. Nice when they actually bloom the right time of year! The other one has got a couple of big buds on it, so I think it’ll bloom — maybe tomorrow? Perfect timing – and ours is out too. Lovely. My cactus gift bloomed like crazy. Flowers wilted and now the 30+ buds left are just withering up and falling. I’ve moved it to a different area to see if it likes the weather there better. Mine seem to like an east facing window. Morning sunlight? It’s good they like it because I don’t have anywhere else to put them! I moved mine from west window where shade are open during the day and mostly shady, to east window where light filters in through the closed shades. I checked this morning. Very sad looking buds. Oh well. Next year maybe. And to you and all of yours, too!